LPC1768-Mini-DK2 is a small evaluation board production by Haoyu electronic, it based on the NXP (NXP Semiconductors) LPC1700 series processors (Cortex-M3 core). 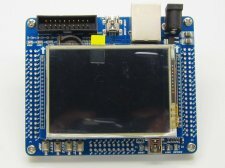 LPC1768-Mini-DK2 clock can be set up to 100MHZ, it contains an Ethernet interface, USB HOST / device interface, UART interface, SPI LCD interface, 16-bit parallel LCD interface(more faster). The LPC176x/5x are Cortex-M3 microcontrollers for embedded applications featuring a high level of integration and low power consumption at frequencies of 100 MHz (120 MHz for LPC1769 and 1759). Features include up to 512 kB of flash memory, up to 64 kB of data memory, Ethernet MAC, USB Device/Host/OTG, 8-channel DMA controller, 4 UARTs, 2 CAN channels, 3 SSP/SPI, 3 I2C, I2S, 8-channel 12-bit ADC, 10-bit DAC, motor control PWM, Quadrature Encoder interface, 4 general purpose timers, 6-output general purpose PWM, ultra-low power Real-Time Clock with separate battery supply, and up to 70 general purpose I/O pins. The LPC176x are pin-compatible to the 100-pin LPC236x ARM7 series. One serial interface, use CP2102 (USB to RS232 interface, support ISP download). RJ45-10/100M Ethernet network interface (Ethernet PHY: LAN8720A). 2.8 inch TFT color LCD interface (SPI interface or 16Bit parallel interface). USB 2.0 interface, USB host and USB Device interface. TF SD / MMC card (SPI) interface. Two user button, One Reset button and ISP button , one INT0 button, two user-programmable LED lights. Serial ISP download, Standard 20-pin JTAG download simulation debugging interface. can be choose external 5V power supply or USB 5V supply. board size: 95mm * 78mm.